The purpose of AHA Region 7 is to promote, encourage and stimulate popular interest in the outstanding using qualities of the Arabian Horse, to formulate publicity and educational programs in the interest of the Arabian Horse owner, club and enthusiast, to foster and encourage good relations between members, to promote and coordinate Arabian horse show activities throughout AHA Region 7, and to hold the Arabian and Half-Arabian Region 7 Championship Horse Show. It has been brought to our attention that a horse tested positive for neurologic EHV-1 (EHM) in Scottsdale, AZ. This is of concern to us because the positive horse attended a show in Las Vegas, NV at the South Point Equestrian Center the previous week. As many of you know the Arabian Breeders World Cup was also held at the South Point this week. The Region 7 Show Commission, under recommendation from our Show Veterinarian Dr Byrne, has decided that any horses that participated at the World Cup will not attend the Region 7 Show. We are also asking that exhibitors self quarantine at home after returning from the World Cup. Any trailer used to transport horses from the World Cup need to be disinfected before hauling horses to Region 7. We would strongly encourage exhibitors to remain vigilant and this is best accomplished by taking all horses’ temperature twice daily; any temperature in excess of 102 degrees F is cause for concern. Also look for signs of malaise (sickness) including coughing and nasal discharge, off their feed etc. While at the show if a horse exhibits any of these signs you should contact a veterinarian and show management immediately as we have an isolation area established. We also ask that everyone use the best practices for biosecurity protocol. · Limit Direct Contact with other horses and people. Do not allow horses to touch noses or visitors to touch your horse. · Monitor your horse for clinical signs and report temperatures in excess of 102 degrees F to your veterinarian and show management. · Avoid sharing equipment unless thoroughly cleaned and disinfected between uses. · Do not dip the end of the hose in the water buckets. · Use different wheel barrows for feeding and cleaning stalls. If you do have a horse with a fever or other clinical signs please inform show management immediately. They have the resources in place to help with anything that may arise. If you have any questions or concerns please feel free to contact us. Region 7 and WestWorld are working together to keep our horses safe. The show grounds will be disinfected this week and we will be closely checking all vaccination records for ALL horses that are brought to the show grounds - to include horses not showing. Reminder: Don't forget to complete the MANDATORY USEF Safe Sport Training. Beginning January 1, 2019, every USEF adult member (18 years of age and over) with a "competing membership" must complete Federation approved Safe Sport Training in accordance with the U.S. Center for Safe Sport Education & Training Policies. See USEF GR1303. Proof of completion of the training must be presented in the show office to pick up your show packet(s). SATURDAY, APRIL 27: SPHUS and SPHIH Dressage Type Championship Classes will be judged by Dorie Vlatten-Schmitz. SUNDAY, APRIL 28: Dressage Championship Classes will be judged by Dorie Vlatten-Schmitz. 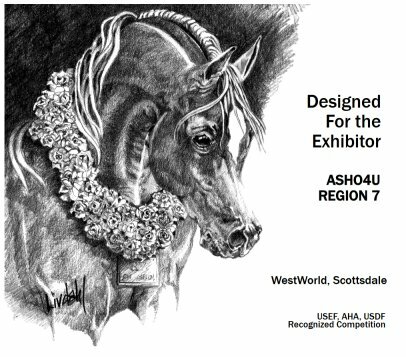 If you qualify at the preshow for Region 7 Western Dressage please enter at the main show office as soon as possible after qualifying and then return to the Dressage office to get your Region 7 ride time from Lois Whittington. We are asking for your cooperation due to the extremely large number of Western Dressage preshow entries. We want you to have your Region 7 ride times with as little delay as possible.